Our meeting will be held July 15,2009 at the Harrod Park Harrod Oh. Time of the meeting will be 6:00 P.M. Bring your metal detector with you if you would like to hunt the park before and after the meeting. This is the last call for dues, if you are not paid by this meeting this will be your last Newsletter!! The Dues are still the same just $10.00 bucks. If you are unable to attend it is ok to send your dues with someone else and Colleen can get your card to you. We already have 20 paid members. We have some new members this year and they are very eager to get out and hunt so get with them if you can...it is always fun to hunt with someone else. For those of you that could not attend the Memorial for Jan Wagner’s husband William (Bill) I would like to say that my wife and I went to the memorial. What a way to say good bye to your loved ones and friends. Bill set the memorial up and it was by far the best memorial that my wife and I have ever attended. The Lima Bean Chorus sang many songs and Jan’s Daughter-in-Law, Jill Wagner Sang “His Eyes are on the Sparrow”. Very well done. I don't think there was a dry eye in the place. The Ice cream social and Luncheon were also very well done. May you rest in peace William D. Wagner. Here are a couple of great forums to look at on the Internet. Http://www.treasurenet.com &http://www.mytreasurespot.com They are both Great sites. 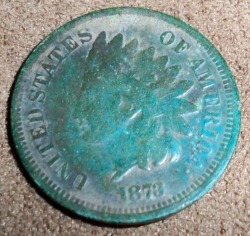 Many detecting finds are posted here daily also. If you’re interested members of the club meet the third Monday of the month for breakfast and a Bull S_it session at Bob Evans on Rt. 309at 8:30 A.M.
Just a word or two. I just got out of the hospital Thursday July 9th. With the great help of my wife and a great staff at the ER at Bluffton Community Hospital, I am here to write the newsletter. Doctor Sullivan the Emergency Room doctor, I would say, saved my life. He would not give up until he found the cause for my low oxygen levels. Long story short, I have blood clots in my lungs and am now on coumadin or Warfarin for the next six months. I am slowly getting my strength back. Boy I hope none of you ever have to experience this, it will as Tom Ahl say’s, Knock your socks off! I hope you all have a safe and great metal detecting summer, I hope to be back hunting with you this fall. Lila Dickerson graciously took over writing the minutes for the club. Here are her notes. Meeting was called to order June 17, 2009 by Jeff Hauenstein and 17 members were present. Finds of the month include Colleen Bradley found a 1951 Shawnee High School class ring in Lake St. Mary’s and found the owner. In fact she was featured on the front page of The Lima News right before our meeting, also I think the St. Mary’s paper did a story on the find also. This was also in last months newsletter. 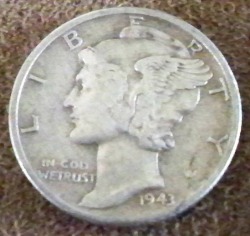 She also found a really nice 1942 Walking Liberty half while hunting at Harmon field in Wapakoneta, along with Harry Foster and Lila Dickerson. The field was scraped and now is covered with artificial turf. Harry found 92 clad coins, plus 9 silver dimes and a really nice silver quarter, along with several buttons, dated graduating classes of 83 & 85 and a sterling ring from a boy named Sue. Way to go Harry. Bill and Lila started together and then Bill left for California so I had to finish. Together we found 74 quarters 52 dimes13 nickels70 pennies21 wheaties along with my find of 5 silver dimes and 3 of them coming out of the same hole, a 36, 37 and 42. Boy was I excited. Oh yes Bill and I both found a Kennedy half. Go figure. 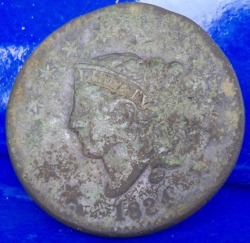 Earlier at another site Bill found a nice Cameo necklace: blue face on white background. Go Bill. Don Doute found silver halves from bank, plus presidential wood case was returned to him 1 year later from neighbor saying his son had stolen it. Naturally the first 4 presidential dollars were missing. Also Don found a sterling ring and some unusual finds plus earring, whatever that means. I'm yet to figure that one out but I wrote it down. Oh well age is a terrible thing. Tom Leugers found a sterling ring with a turquoise stone and a 1936 mercury dime. He donated the dime to the club for the hunt in September. Tom also found a 1824 Large Cent (above), a 1873 Indian Head penny (below) and a 1943 Mercury Dime (left). Gary Rutledge found a really nice 1930 Standing Liberty Quarter, a 1928 Mercury Dime1963 Roosevelt Dime1943 P & 1944 P War nickels, a Liberty Island NY Medallion and a big Saint Christopher medallion. Gary also found a small gold ring. Denny Morrison found TWO 1943 Walking Liberty half dollars, a 1935 Washington Quarter3 Mercury Dimes 1943 1925 1943 and 2 Roosevelt dimes 1948 & 1949 he also found a Saint Christopher and a small Sterling Silver Ring. Denny Morrison reported on a Relay for Life & car show for weekend of June 20 in Bluffton. He was on Fox News talking about the parade in Delphos and caravan of vehicles from WWI and later that was following the Mother Road. Denny has more on this. He also mentioned that he was going to clean coins and this got me started cleaning ours. Bill took the job away from me when he came home and found the solution running out of the tumbler onto the workbench. Really made a mess. So he mixes up a batch, turns the tumbler on and it blew up, took the end right off and the nasty cleaning fluid was running all over the workbench. AGAIN. Boy was that funny. That actually was a lot of fun. Thank You Lila for those Great minutes.